New York City is one of the most expensive cities in the U.S. to rent in so one can only imagine the price tags of the units actually for sale. Investing in real estate in New York City can be expensive, but nevertheless, an investment if NYC is the city where you see yourself living for the rest of your life. With more than 8.5 million people residing, across the five boroughs, there are plentiful of housing and investment opportunities for those looking to purchase real estate. This monthly report has its focus on the previous transactions made in October, showing the most expensive transactions (commercial transactions excluded), celebrity transactions, and some statistics to go along with it. The data for the report is provided by ACRIS. The number one borough with the highest share of sales transactions in October was Queens, again. However, the percentage of total transactions for the past month did not change, as the share is still 36% of the total number of transactions for the four boroughs. For the month of September, second place was tied between Brooklyn and Manhattan. This time around, Brooklyn takes second place with 29% of the total shares. That is a 3% increase in total transactions for Brooklyn this time around. In third place we have the borough of Manhattan, with 25% of the total transactions made in October. For Manhattan, that is only a 1% decrease from the month before. Lastly we have the Bronx. For the month of September we saw that the Bronx jumped from holding down 9% of the total transactions to a strong 12%. For October, the borough had a slight increase in transactions and landed on 11% of the total transactions for the month. Again, the borough with the highest median closing price is Manhattan. This time around, the median closing price for the borough was $1,030,000. That is a 2% decrease in closing price compared to the month of September. Coming in second is again Brooklyn. For the month of October, Brooklyn’s median closing price was $781,985. Brooklyn experienced a 2% increase in the median closing price. Not too far behind, we have Queens. Like Manhattan, Queens also experienced a decrease in the median closing price, as the price went from $585,000 in September to $570,000 in October. While it’s only a $15,000 decrease in price, it is still a 3% decrease in the median closing price. 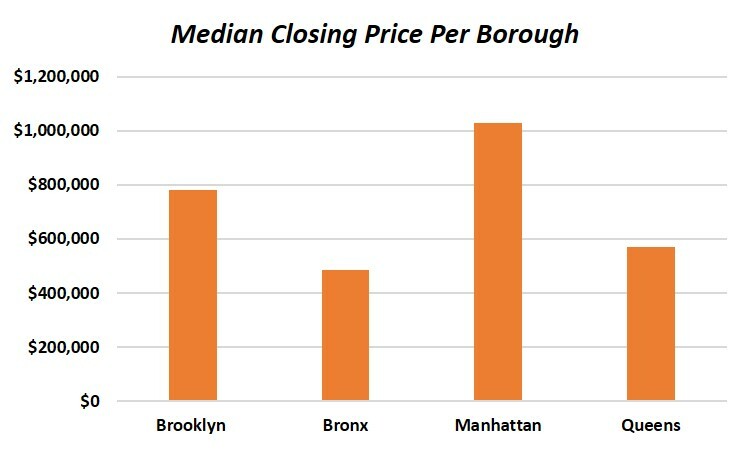 The borough of Bronx is also not far behind Queens when it comes to their median closing price. While Queens had a median closing price of $570,000, Bronx ended up with a closing price of $485,000. That is a 4% increase in price from the month before. 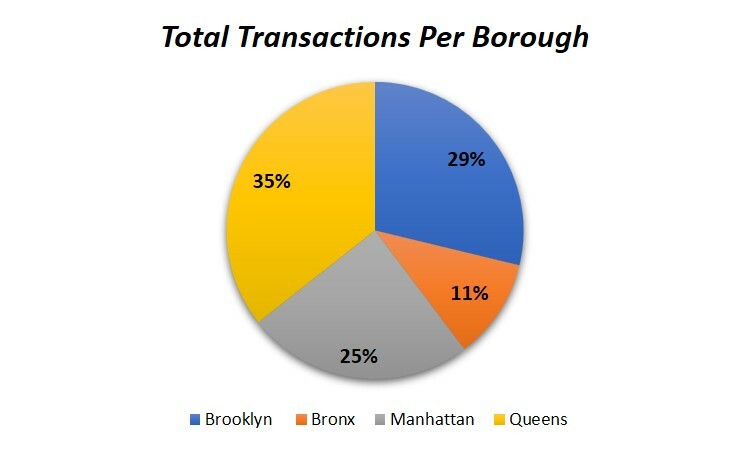 The table below shows the total transactions in October for the boroughs Manhattan, Brooklyn, Queens, and The Bronx. Obvious commercial transactions have been removed from the table (as well as any transactions that didn’t clearly show if it was a commercial transaction or not). The data in the table is provided by ACRIS for the month of October and ranks the transactions by the most expensive. We limited the transactions listed below to those of the cost of $100,000 and above. To search for transactions by borough, please refer to using the search field.